This September 1, 2017, file photo shows a representative from the Guinness Book of World Records at a record attempt for world's largest sand castle in Duisburg, Germany. 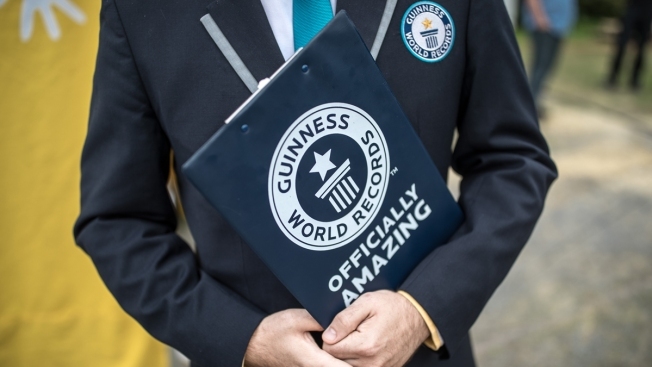 A long-tailed cat, an octogenarian bodybuilder and a five-inch long eyelash are included in the latest edition of Guinness World Records. A Chinese woman has set the record for world's longest eyelash, at nearly five inches (12 centimeters). An 83-year-old great-grandfather from Los Angeles has been named the world's oldest bodybuilder.